There’s been snow on the ground for over four months now, and in March, we’re likely to see a lot more. As we continue in the throes of winter, we offer to you our sincere gratitude for your kind and generous help. Words fail to express how thankful we are to you, and we pray for you and your intentions every day. DAILY JOURNEY: For Public affairs director Laureli Kinneen, the winter commute to Nome seems normal, though to the rest of us, it would appear extremely daunting. Every morning, she and her husband Fen take the kids a mile to the nearest plowed road by snowmobile, then drive 13 miles on the gravel road, which is narrow, icy and often drifted, during the winter in darkness. 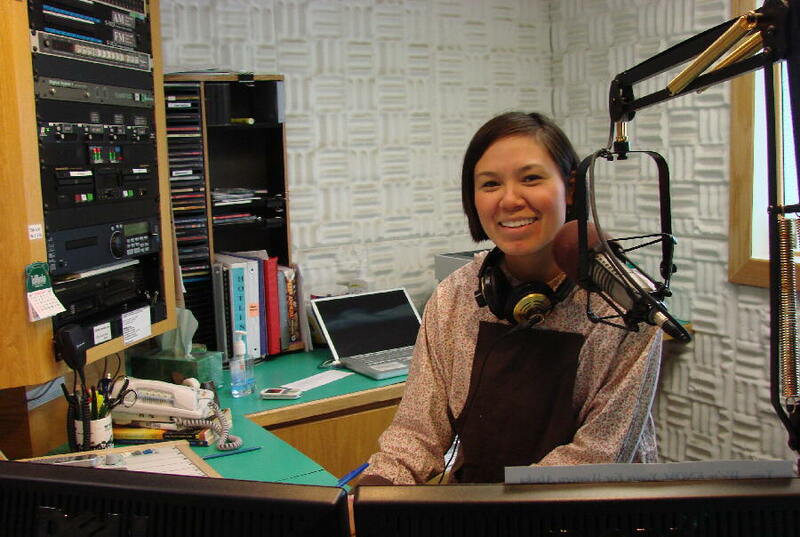 Shortly before this photo was taken, Laureli told KNOM listeners her menu for the night’s dinner. She planned to add boiled potatoes and carrots to a traditional Eskimo meal of dried salmon, seal oil, muktuk (whale blubber) and black meat from a bearded seal. DO YOU KNOW SOMEONE who you think might make a great KNOM volunteer? We are currently searching for volunteers for the 2009-2010 year, to join the almost 300 individuals who have volunteered for the mission since 1966. If you do, please have them check out details at www.knom.org, and if they’re interested, e-mail belong@knom.org for an application and more information. Yes, we’re isolated and the weather can be tough, but they would join a wonderful group of people in a caring workplace who are working hard to better the lives of others. INSPIRATIONAL SPOT: If you ever grow discouraged and think you aren’t good enough, remember: The Titanic was built by professionals; the ark by amateurs. SQUIGGLES: (left) The jagged lines on the right hand Studio C monitor represent a short bit of audio. Volunteer Danielle Sylvester is editing the piece for a February call-in program discussing ways in which western Alaskans can economize. The show had an enthusiastic response. 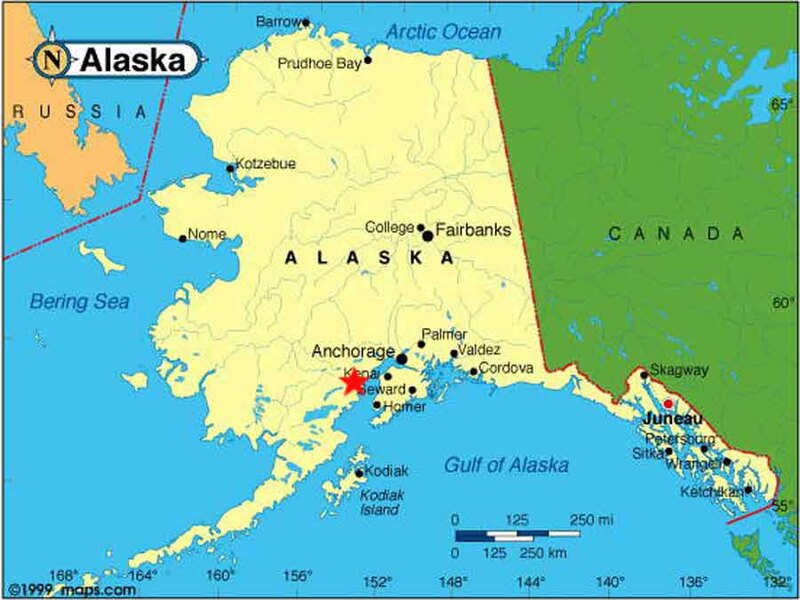 The economic woes of remote Alaskan villages have made national news recently. In the villages which KNOM serves, the majority of people are unemployed, and eke out a living by fishing, gathering and hunting, and by arts and crafts, such as ivory and bone carving, skin sewing, and basket weaving using local grasses. Many receive public assistance. This year, their poverty was compounded by a disastrous fishing season. Additionally, the winter’s supply of heating oil and gasoline were delivered in late summer, during the peak of oil prices. In some places, people are paying up to $10 a gallon. To heat a home can cost up to $1,000 a month. Thank you for helping people throughout 100,000 square miles share concrete ideas on how to weather this crisis. 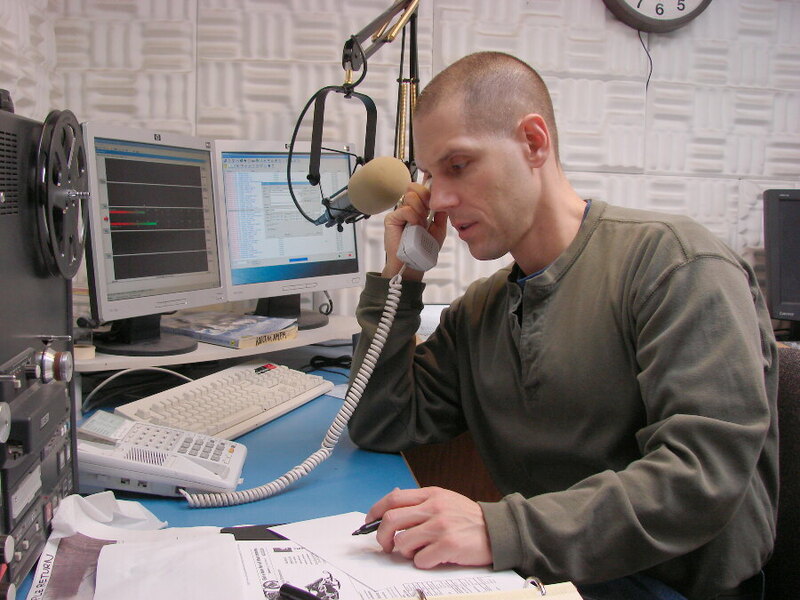 OTHER RECENT TOPICS of call-in programs include education, winter safety, the difficulties of law enforcement in the Alaska bush, prenatal care, self-improvement, mining and employment. Again, thank you very much! WHERE THERE’S A WILL: Please consider adding KNOM to your will. We prayerfully place all bequests into funds that will provide for future major improvements, and protect the mission from unforeseen emergencies. INSPIRATIONAL SPOT: He alone has a right to despair whose sins are as great as the mercy of God. — St. Augustine of Hippo, 354-430 A.D.
ANSWERING THE CALL: (left) In Studio B, news director Paul Korchin answers the phone for Danielle’s call-in program. At many stations these days, telephone screeners signal program hosts by computer, but at KNOM, we still communicate by taping notes on the glass window that separates the screener from the studio in which the show is being produced. OUR PROMISE TO YOU: We honor your privacy, and we pledge, as we have for more than 40 years, that we will never provide your name and address to anyone for any reason. EXPLOSIVE STUFF: Alaska is home to 130 volcanoes, more than fifty of which have erupted in historic times. As this is written, we are still awaiting the eruption of Mount Redoubt, a 10,000 foot volcano in the Alaska Range. Its seismic activity has been elevated since January 25th. Nome is 460 miles upwind of Mount Redoubt. (The map, left, shows Redoubt's location as a red star.) Its eruption will probably shut down air travel to our isolated town from the outside world. When the mountain last blew, starting December 14, 1989, volcanic ash canceled flights out of Anchorage. Nome’s post office boxes were empty, Christmas presents were absent and grocery shelves lay bare for a week. EDUCATIONAL SPOTS this month deal with subjects including sunlight, traditional Alaska Native thoughts, emphysema, Arctic birds, Nigeria, earth science, job opportunities, drinking water, child abuse, cancer, dog bites, nutrition, reading, and recovery from alcohol abuse. Thank you for making these possible. 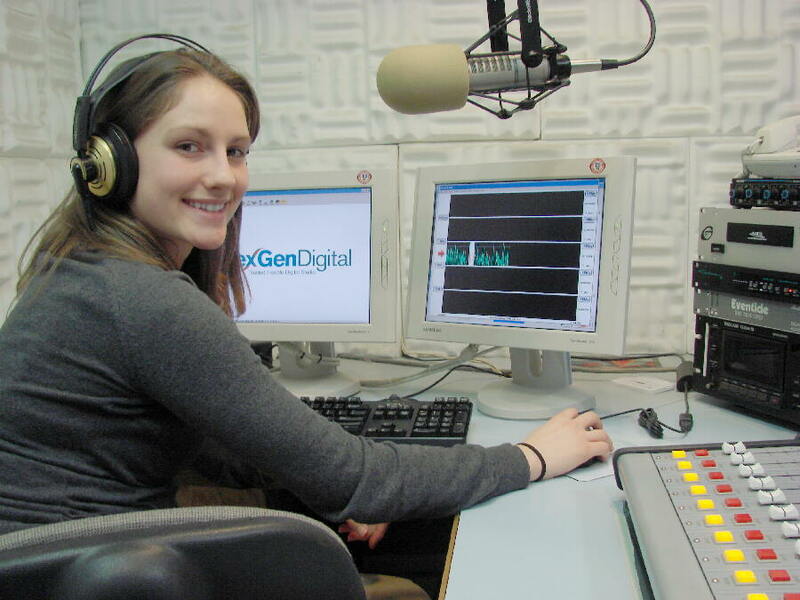 KNOM is the oldest Catholic radio station in the United States, and by a long shot. It is you who keeps our mission alive and well, beaming education and inspiration 24 hours a day. Thank you! INSPIRATIONAL SPOT: Life is a journey, not a home; a road, not a city of habitation. The enjoyments and blessings we have are but little inns on the roadside of life, where we may be refreshed for a moment, that we may with new strength pass on to the end. And…we know that we never travel alone. 20 YEARS AGO: March 15, 1989, for the first and only time, the Associated Press Radio Network carries KNOM’s live broadcast of the Iditarod win. Joe Runyan’s first place finish is heard live around the country, including Los Angeles and Chicago, and around the world via Armed Forces Radio. Listeners praise the broadcast, but it causes a great fuss, as anchor Tom Busch is not a union member. AP and its unions are still scrapping about it years later. 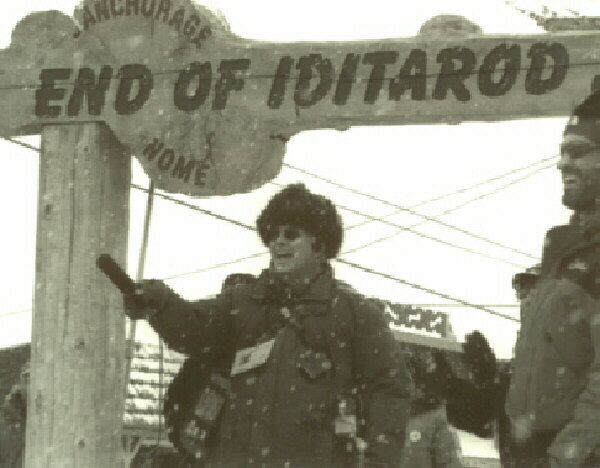 (Left) Tom calls in a team at the Iditarod finish line in 2001. Tom estimates that he has interviewed about 800 dog mushers during the 32 Iditarods he covered. 40 YEARS AGO: It’s a monumental day for the mission. Hennessey also requests a waiver of a freeze that the FCC had recently imposed to block AM applications, pending a detailed study of AM interference problems in the Lower 48 states. he application optimistically lists the estimated construction cost as $69,433, including $5,000 to renovate the James Walsh house on 3rd Avenue into a radio station. Among proposed programs is “Alaskans A-Go-Go,” which would portray the accomplishments of western Alaskans who had achieved their goals. It is a wildly ambitious proposal for differently themed programs every hour that, with the arrival of professional broadcasters a couple of years later, is molded into a consistent feasible format aimed at accomplishing the stated goals. WHETHER YOU’VE BEEN WITH US for forty years or just a month, you know that it’s been a long, usually difficult, sometimes painful, journey for this mission. What sustains us is the knowledge that we are helping educate and inspire impoverished people 24 hours a day, every day. As always, we thank you and we honor you for your role in this important work. May God shower you with blessings for your kind help and your prayers!